Actually, I would be enjoying this environment whether I were writing or not, but I'm still writing every day and also sight-seeing. I especially enjoy seeing the different plants and birds out here in southern California. The mission architecture is also a beautiful change from Midwest clapboard white. Although I don't enjoy sharing this space with millions of other people, I've found that walking increases my enjoyment. Driving in a car is rather like being a NASCAR driver, with the only reward being arrival at the destination unscathed. From where I am staying at my in-laws' house, it't about a two-mile walk to the beach, about a third on the level of the spine of a hill, and the rest downhill to sea level. I saw some beautiful homes and some huge eucalyptus and pine trees today on my hike. 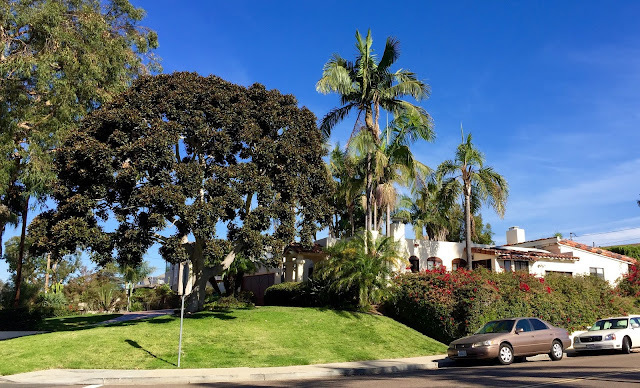 A Mediterranean-style home with some tropical trees. Here is one street-corner home I passed on my walk. It didn't have the huge trees but was a beautiful combination of flora definitely not present in the Midwest, and of the Spanish mission-style architecture. 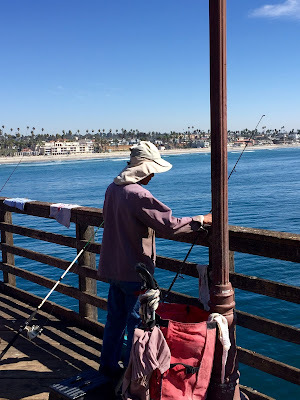 We also spent some time on a pier at Oceanside, and to see the locals fishing was fun. They were actually catching some silver fish about ten inches long. They had a long haul to get them up from the water to the pier, though. I don't know how successful they would have been with a really big catch! Quite a few anglers of Asian ancestry, catching fresh food for dinner. 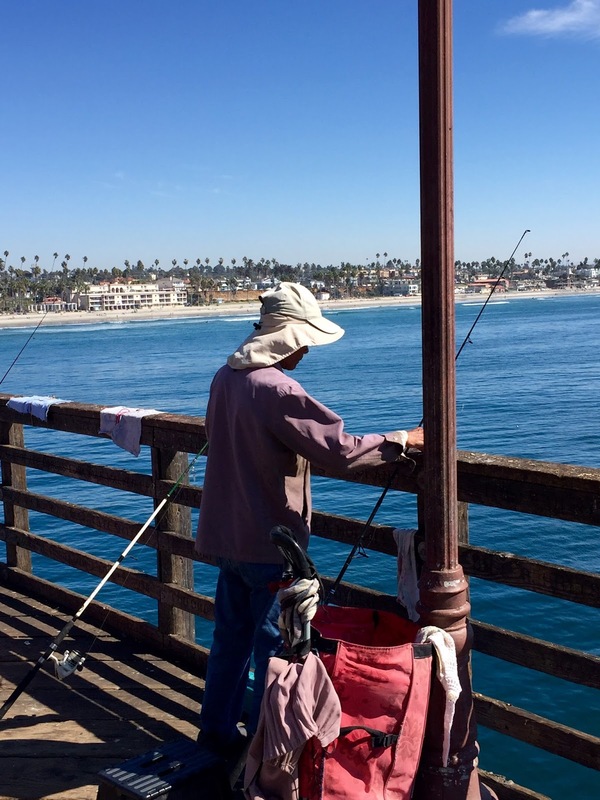 From appearances, some of the anglers fished regularly from the pier. They were organized with their gear and bait, and treated the tourists (me) like someone would treat a chipmunk or rabbit in the Midwest--by ignoring me because I'm one of a million! 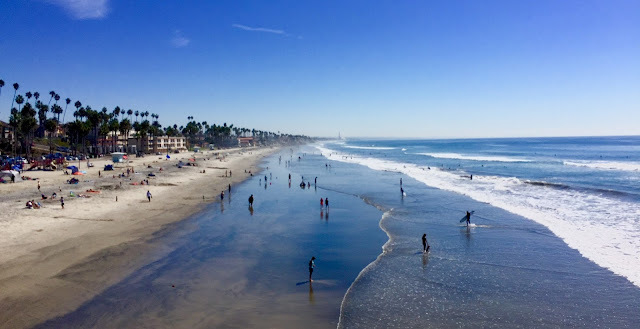 Of course, the ocean was the predominant geographic reality, the sounds of waves breaking on the shore and splashing against the pier's pilings, the open horizon and the blues of the water and sky, the sea smells of sea life and seawater. It was also enjoyable to be out on an unusually hot day for this time of year--in the high 80's--when we are experiencing much cooler weather in the Midwest. All the people were enjoying the ocean, including surfers farther out. It's a joy to take the time to write on my current project, and to also spend time on this blog again. I'm just short of 7,000 words A Mage That Gathers.